Somehow, watercolorist Steve Mumford, convinced his wife to let him go, the editor of an on-line arts magazine, artnet.com, to issue him a press pass, and his hands to produce beautiful images. All this during the invasion and occupation of Iraq. Mumford's book Baghdad Journal (Drawn and Quarterly, 2005) is a large-scale, saturated visual narrative that deftly captures soldiers and citizens, stay dogs and looters, elegant mosques and burnt out wrecks, beat up sedans and Bradley fighting vehicles–all the texture, color and human drama of the post-Saddam era. Steve details his first-person narrative as an artist struggling to understand the value his presence can bring to the situation. The results provide illumination on how a peaceful man with no ties to power or influence (and a limited budget) can navigate and survive in a looted landscape; how citizens of an occupied country can extend a helpful hand to a stranger; and, how art can be created in the context of war. Drawing here takes a little getting used to. 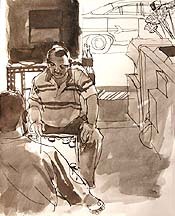 The Iraqis are intensely interested in most things western, so the presence of an American sitting on a stoop or at a cafe making a drawing always elicits an avid audience. Every brushstroke is watched, and people have many questions. The Iraqi sense of personal space is very different from a westerner's; here people crowd in so close they're touching me, and men feel free to stab at the paper to point out someone I've drawn whom they know. If an onlooker blocks the view, however, he'll be shouted at to get out of the way. Sometimes a passage is greeted with a round of "tsk, tsk, tsk," which in Iraq doesn't necessarily connote disapproval as much as interest (I think). I spend a few hours working on Karada Avenue, the mecca for appliances and satellite dishes. It's a major boulevard, the sidewalks cluttered with big stacks of boxes, satellite dishes arranged like blossoming flowers as far as the eye can see in both directions. Sometimes you have to go through a maze of these boxes to continue down the sidewalk. The usual chorus of "Hey, Mister!" follows me as I go. When I locate a good vantage point to draw, the salesmen come out to look, then offer to pose. One pretends to flag down a cab, and then has to explain to several irritated cab drivers that he doesn't in fact want a ride, much to the amusement of the others. Starred Review. With countless war accounts already in from Iraq, it's refreshing to get this dispatch told, from the perspective not of a journalist or a photographer, but of an artist. Mumford, a New York City painter, first arrived in Baghdad in April of 2003 and spent about a year there, and in other cities, accompanying U.S. troops on patrols, raids and combat missions. But the most arresting images in this illustrated journal come from his more mundane interactions: with people in cafés, at a meeting with a local imam, at a galley favored by local Baghdad artists. Mumford writes that, for him, "the act of drawing slowed down the war, recording the spaces in between the bombs," and it is through these spaces, the day-to-day of life in a country where life runs minute-to-minute, that Iraq and its war become illuminated in a way that we rarely see. At first glance Mumford's watercolors carry something of the hasty urgency of courtroom art, but this impression is soon belied by the images' depth of feeling and nuance. Accompanying the watercolors are passages from his journal, written in a lucid and reflective style that perfectly matches these quiet spaces pushing out at the surrounding chaos. His is a remarkable document.